Hans Bennis is director of the Meertens Institute (Royal Netherlands Academy of Arts and Sciences) that is directed towards research and documentation of Dutch language and culture. He is also a professor in Language Variation at the University of Amsterdam. Bennis is a generative linguist with a specialization in the field of Dutch syntax. Fred Weerman is professor of Dutch linguistics at University of Amsterdam. Combining work on change and acquisition his research focuses on the role of flexion in natural languages. January 2003, Elma Blom defended her PhD thesis From root infinitive to finite sentence. The acquisition of verbal inflections and auxiliaries at Utrecht University. Within the current project, she will experimentally investigate critical period effects and the role of transfer in the acquisition of inflection by second language learners of Dutch. Alies MacLean does her PhDs at the Meertens Institute. Her research aims to describe variation in verbal and adjectival inflection in the Dutch language, with a special focus on the process of deflection. The research also aims to provide insight in the internal and external forces causing language variation and change. 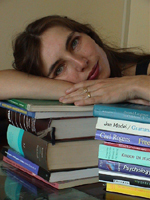 Daniela Polišenská studied Linguistics at the University of Amsterdam. Her PhD project focuses on experimental data collection in order to describe and explain the developmental path of verbal and adjectival inflection by Dutch monolingual children.